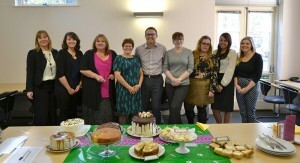 Whilst the nation is enjoying watching the Great British Bake Off, here at TSP we decided to join in with the baking fun by holding our very own TSP Bake Off to raise money in support of Macmillan Cancer’s Coffee Morning. 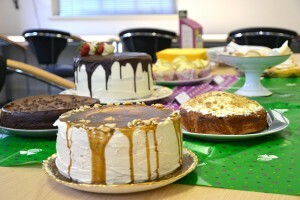 Nine TSP bakers entered a fantastic selection of cakes into the competition which was judged by Managing Partner Steve Webb and Senior Partner Mary Anne Fedeyko. Because the standard of the competition was so high, a joint second and joint third place were awarded and an overall winner. 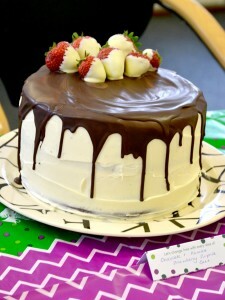 In joint third place were Robert Ashworth with his Melting Moments and Emma Rumble with her Strawberry Surprise cake. Second place went to Alison Cantor’s Lemon Slices and Imogen Grainger’s Butterscotch cake. 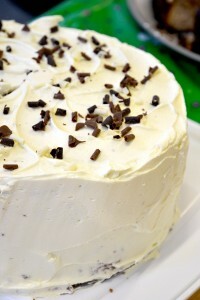 The winning baker was Marie Price with her delicious Chocolate and Raspberry cake, congratulations Marie! The TSP bakers paid £1.00 to enter their cake and TSP staff paid £1.00 to eat cake after the judging had finished. On top of all the baking excitement there were also two sweepstake games to raise more money, Maxine Drummond won the “Guess How Many Sweets Game” correctly guessing 133 sweets in the jar and Alison Cantor won the “Spot the Cake “ game guessing 508 which was the closest to the 495 spots on the cake. 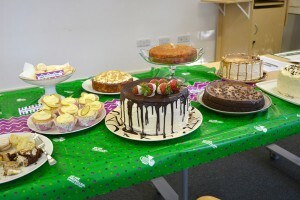 A grand total of £182.25 was raised for this very good cause. Thank you to everyone who participated on the day! Macmillan Cancer Support provides specialist health care, information and financial support to people affected by cancer. As well as helping with the medical requirements of cancer victims, Macmillan helps with the practical, emotional and social impact cancer can have on those individuals and the people close to them. They provide anything from a lift to hospital to grants for heating bills. To find out more about the charity, click here. 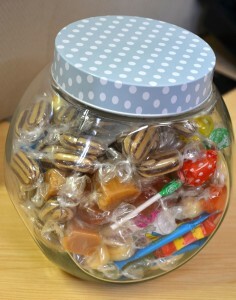 Can you guess how many sweets?